Innovations provide the most important enabling factor behind industrial performance, economic growth, well being, and welfare. This textbook gives the reader a foundation for analyzing innovations both qualitatively and quantitatively. The author forst describes the emergence of intellectual capitalism, then presents a wide range of important issues in the field, including both static and dynamic theories of innovations, commercialization and business strategies, management of intellectual property, environmental innovations, and innovation policies. 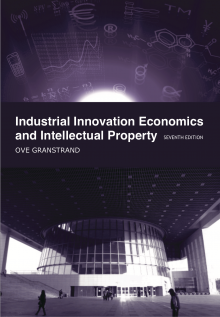 The text provides the reader with an extensive theory-based toolbox for analyzing and managing technology, industrial innovations, and intellectual property. 7th edition. Published by Svenska Kulturkompaniet, Gothenburg, Sweden, 2018 (458 pp. ).